Once again we are excited to report to you of God continued blessings. This special December blessing was printed in the January/February Silent Word Newspaper. Here is a condensed version so you can rejoice with us. 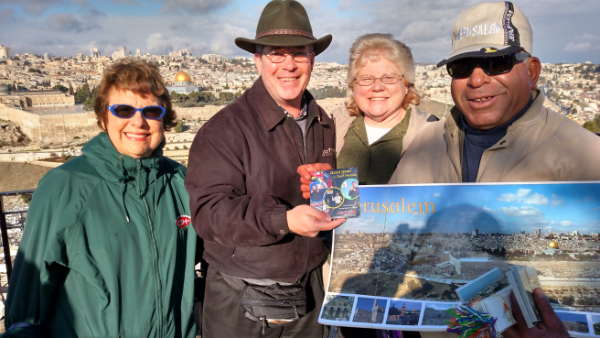 Jon & Diane with Ursala Rasmussen and the Deaf man we met in Jerusalem. On our flight home, we unexpectedly had to spend the night in Istanbul. Bad weather had prevented our landing on time, so we missed our next flight – and so did hundreds of other passengers. We stood in lines for nearly 12 hours getting a new flight, visas, and hotel arrangements for the night. While in the first line, we had the opportunity to share the Gospel with a Palestinian lady who could not go to college in her country of Israel, but had to study in Germany. We gave her a Gospel tract, which she referred back to several times before we parted ways. Once luggage was collected, we finally boarded a bus to go to the hotel, only to be told to quickly get off and board another bus. That was when my second highlight happened. I sat down next a deaf man! He said he was from Bahrain. Quickly, I gave him a card with information about the SWM SignTheBible.com (Bible teaching in Sign Language) website. In less than 3 minutes from meeting him, we were told again, “Wrong bus.” Diane and I quickly got off, and onto a third bus to finally go to our hotel. Imagine – the first and second buses were “mistakes.” But there are no mistakes with God. The Lord planned and worked out a big inconvenience (and long day) for us, but our inconvenience gave the Gospel to a Deaf man from Bahrain. No person could have created such a perfect plan with such exact timing. Our 2-hour flight turned into a 20-hour travel day, but God’s work was done! Wow, Deaf people are everywhere! Please join us in praying for a miracle: that God would use the Gospel DVD, Gospel tract, and website card to bring many people to Christ, especially those mentioned above. 2016 Report – God gave us a great year of ministry. Here are some of the results: Conducted 9 Fantastic Saturdays (Attendance 896, 122 Churches, 429 Deaf, 5 Salvation and 92 Other Decisions) – Conducted two ASL Institute (training) meetings with a total of 215 attendees from 18 states – Conducted the annual SWM Deaf Men’s Retreat at Sand Mountain Bible Camp, Trenton, Georgia – Taught deaf ministry workers and preached revival messages for Deaf people in Belize – Conducted a beginning ASL Class at Grace Baptist Church (Pastor Bill Egerdahl, West Columbia, South Carolina) – Prepared and sent 6 Silent Word Newspapers – Welcomed and began training a new family under SWM Ministry of Helps – Produced new DVDs, including “Who Are Deaf People?” which describes the uniqueness of the Deaf world and the need for outreach – Continued to produce Bible teaching online at SignTheBible.com – And much more. Through all the ministries of SWM there were 726 salvation decisions in 2016. God has given us a wonderful team and a blessed ministry! Anniversaries – Last year marked my (Jon) 40th year in the deaf ministry and our 35th anniversary of marriage and ministry together. Praise the Lord for calling us to this unique, missionary deaf ministry. It is a joy to serve Him. Thank you for the privilege to minister the Gospel and the Bible to Deaf people on your behalf.